So the doubles weekend is over and what a freaking blast that was! 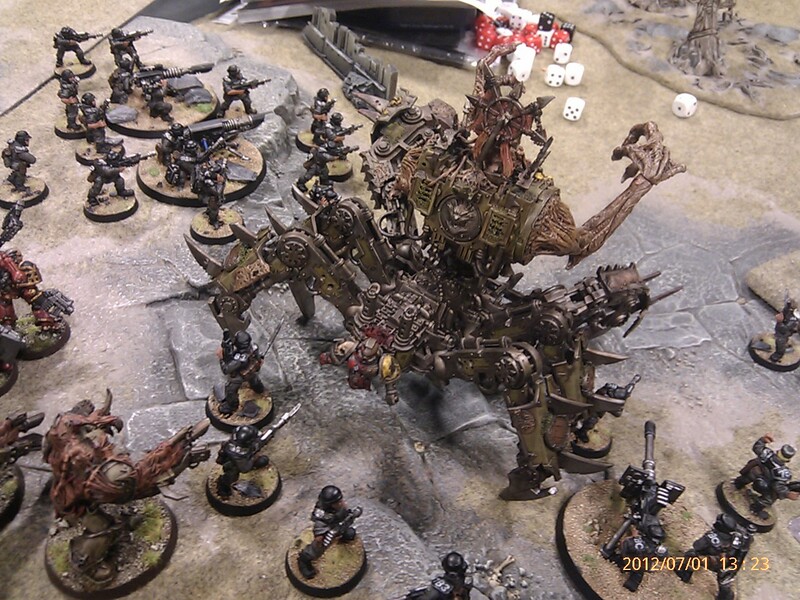 I ended up taking my chaos to the event as 1. i’m lazy and didnt paint the orks and 2. there was a chance i was gonna be playing by my self the first day as Borak had a job interview so playing with 170+ models by my self was gonna be impossible. 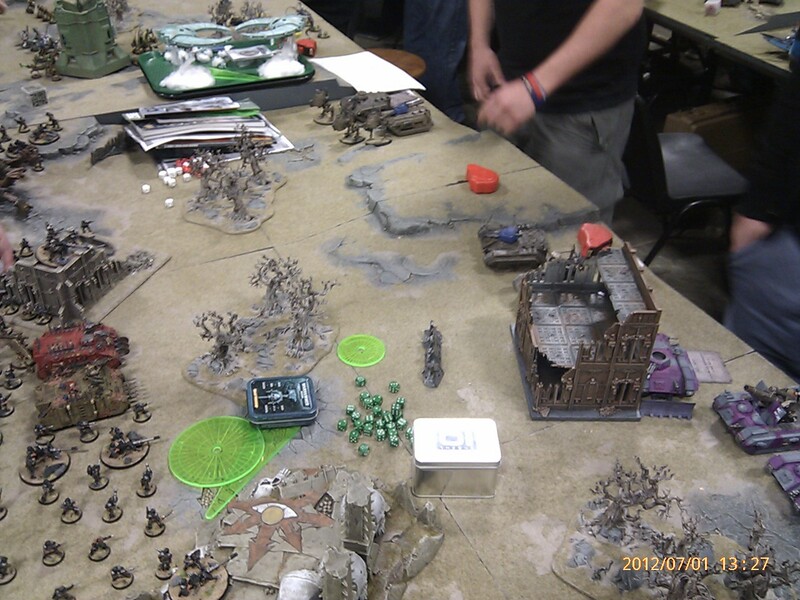 Luckily our mutal mate Neil tool up the place for the first day so it kinda turned out ok. A note here that Neil is mainly a fantasy player, had not even seen the imperial guard side of our force, let alone ever played with them! We came 23rd out of 106 teams! not bad all considered, drawing the first day’s three games and when Borak showed up, winning both of the second day’s games. I’m thinking (not to be to smug) that we’d of probably top 5’d it at least if Borak had been there the first day, but hey its about the fun really and there was plenty of that. 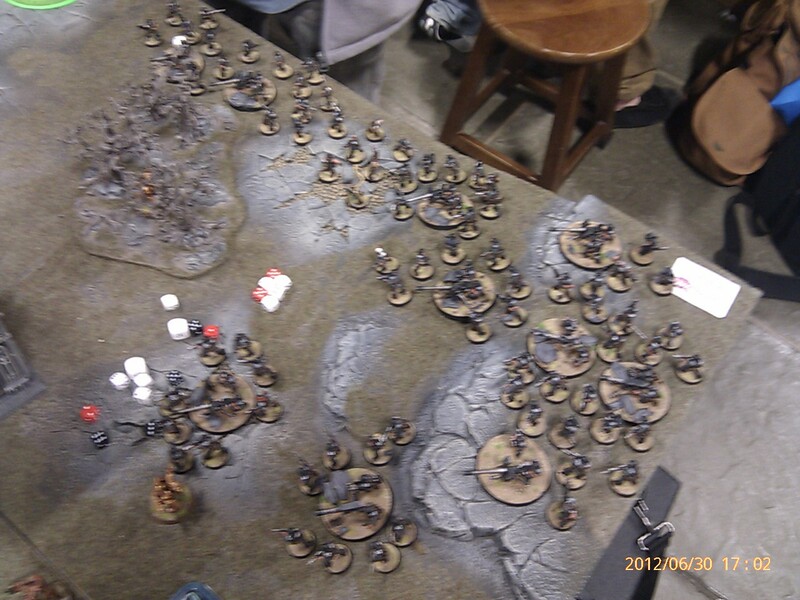 So basically Borak’s army as you can see from the posts he has done was 108 guardsmen! all infantry. 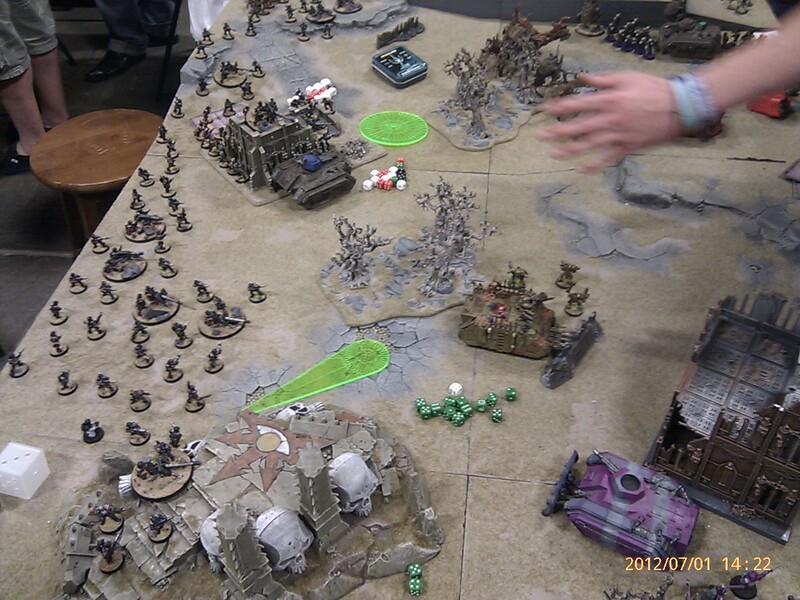 Mine was Chaos space marines, i took some plague marines, berzerkers, daemon prince, defiler and a couple of obilterators. 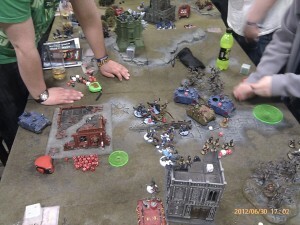 The first game was against a Necron and Blood angels (using Dark angels codex). 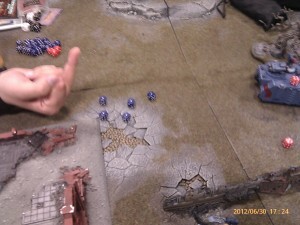 We were really lucky with opponents at the event, none of them were douche bags and all really fun to play against. Neil realised what he had let him self in for with the guard side of the force! it took us about half an hour to even setup! 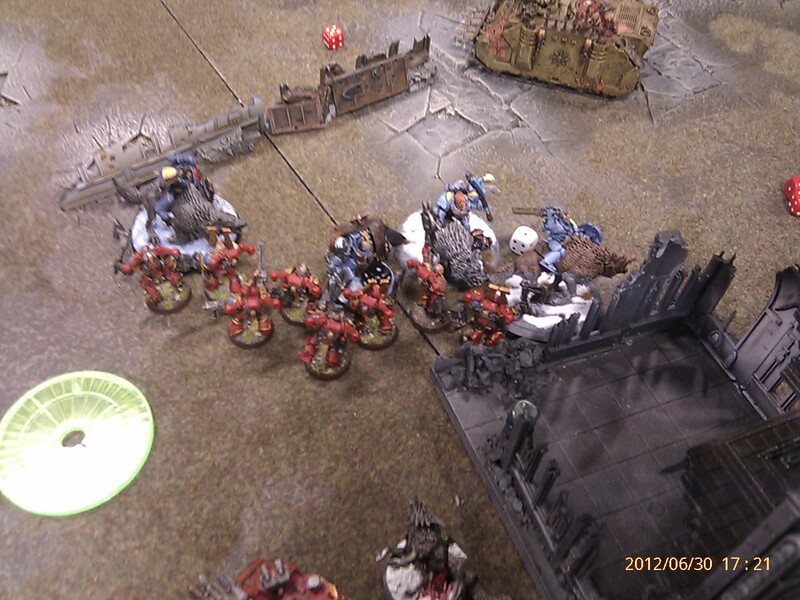 The game went ok, the poor blood angels guy met a lot of my obliterator’s plasma cannons so his stuff fell away pretty quick. We reserved half the guard stuff as we simply could not get our heads around how to set it up. The mission was objectives and by the end of the game out opponents had two to our one. 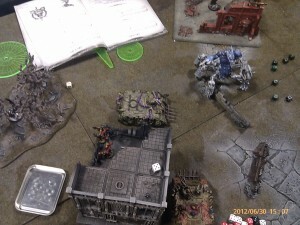 Luckily in this mission you roll at the end and on a 6 for each objective held becomes worth two points. Neil reluctantly rolled the dice and… 6! 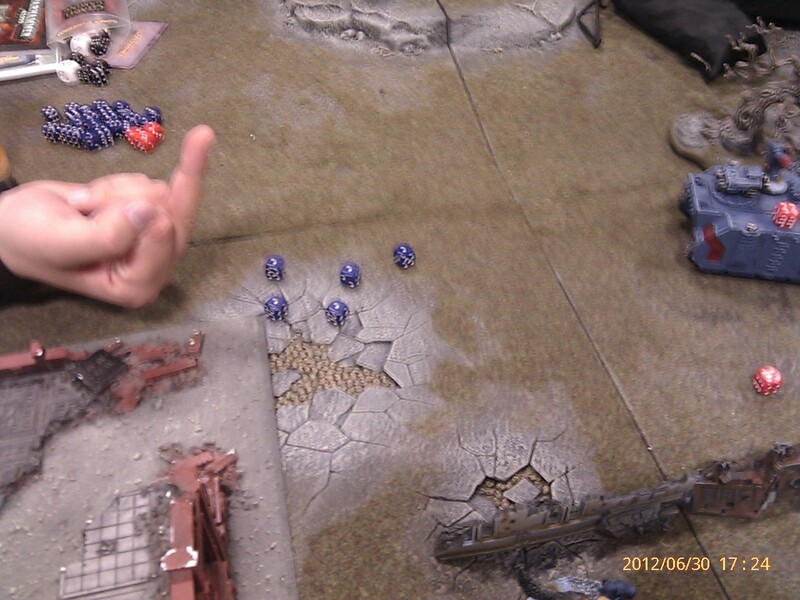 Draw :D.
In game two we played against a chaos space marine and daemons army. This mission was two objectives each where one was a dud you hid from the enemy. 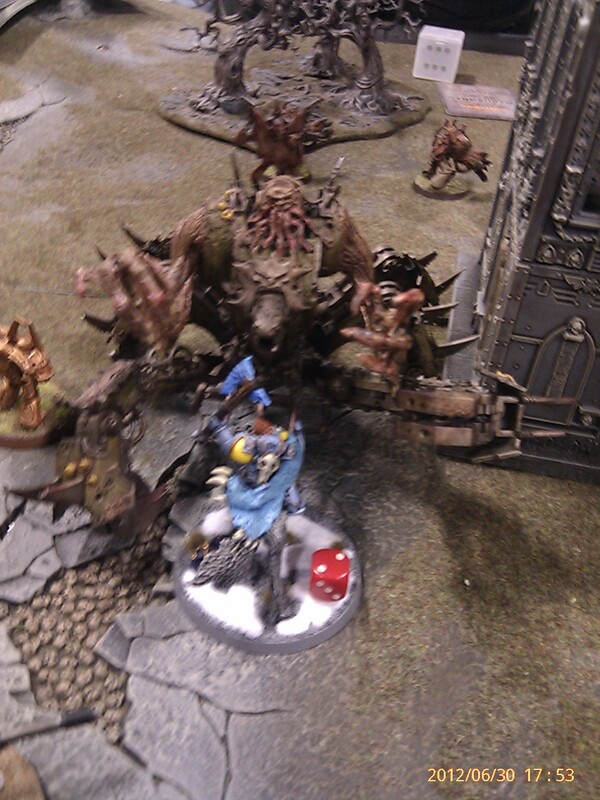 It was dawn of war and in a panic to get models on the table we blob squaded a lof of the guard. Needless to say this was a bad idea and on the first turn they killed about 35-40 guardsmen! ouch. 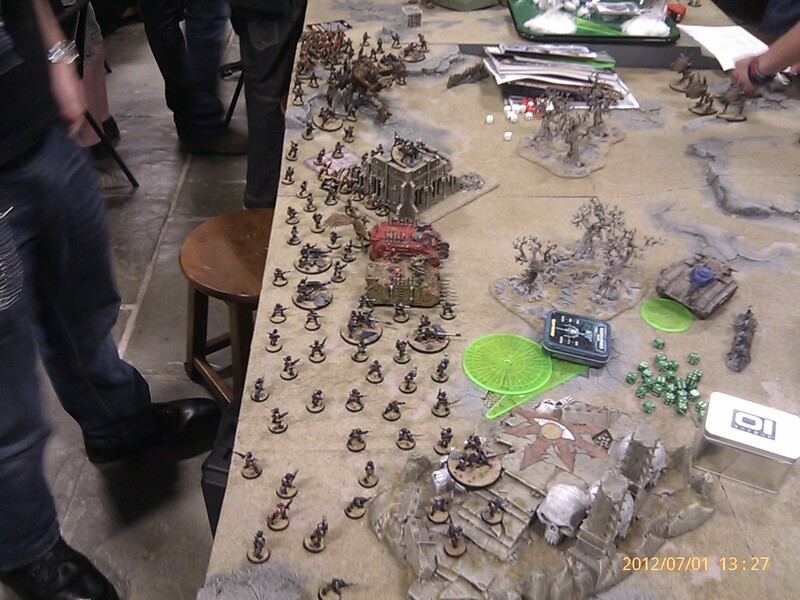 Further to this we still had half the guard to come on first turn, we had put the casualties back in the case and we got very confused as to what was what, ending up just rushing to put the right units on the board, ignoring any kinda tactics. 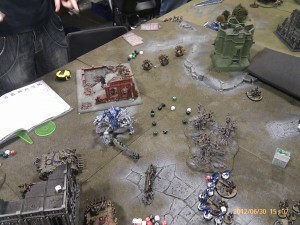 The last game of the first day was against a joint space wolves army commanded by a ‘merry’ scotish and welsh team, you could tell this was gonna be a good one before we even started and sure enough it was! 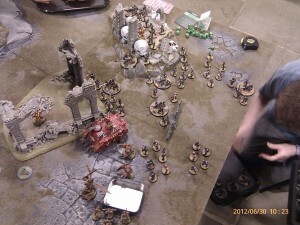 Probably one of the best 40k games I can remember playing, the mission was a point every turn for objectives you held. 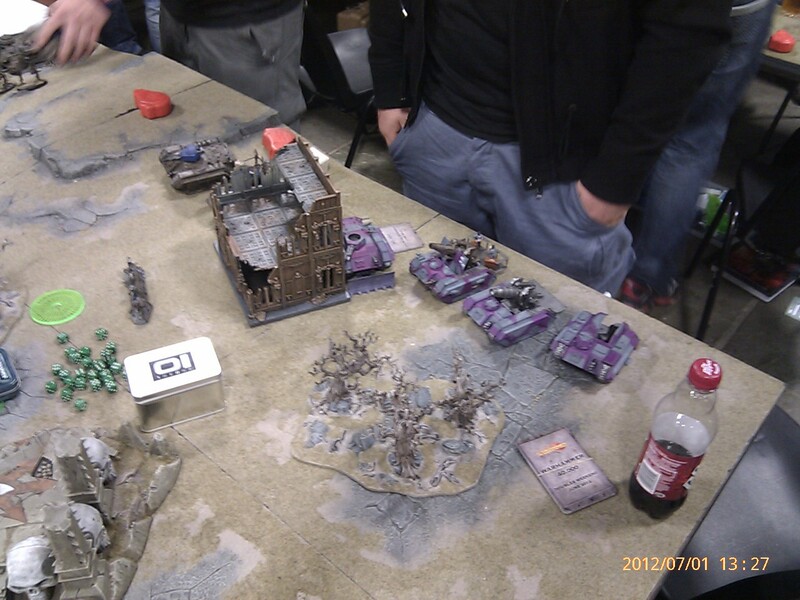 Not only were these two guys freakin awesome to play against (we all teamed up in the pub quiz after) it turned out to be ‘one of those games’ where so much random coool stuff happens it just fills up the gas can of enthusiasm for playing 40k. 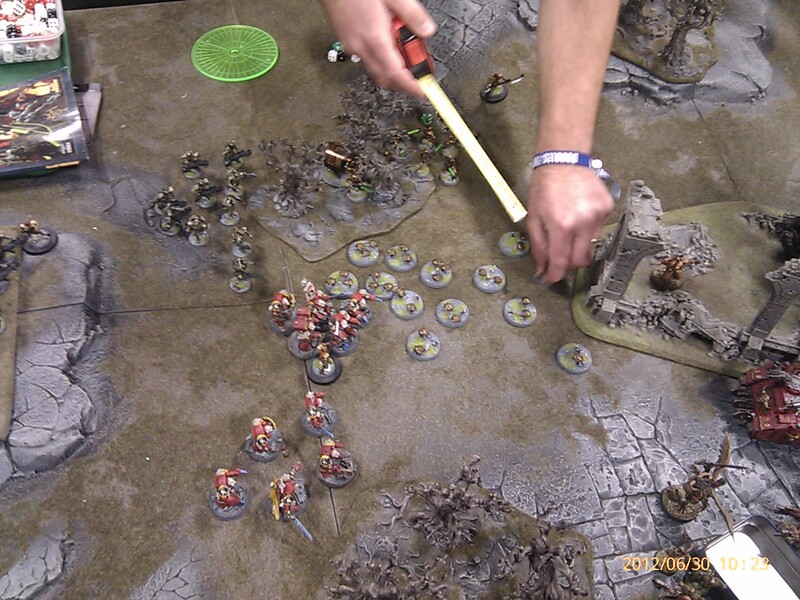 By this time Neil had worked out a way to deploy the guard quickly using the heavy weapons as a reference point and early on it looked like we had really mauled them with shooting. It could not have had a better result – draw. Shockingly we both ended up with 11 points a side! really bizarre that we both got the same considering the scope for the mission but it just was the perfect result really. 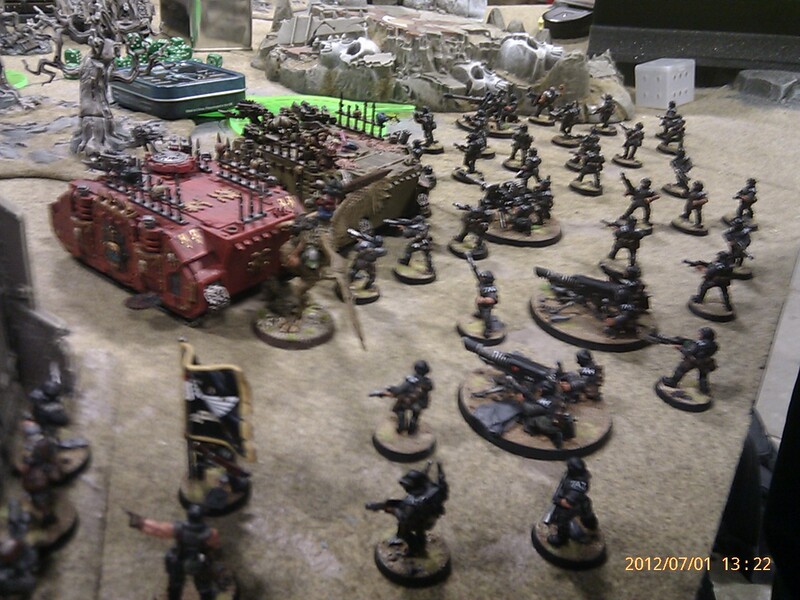 Long fangs firing 2 lascannons, 2 missile launchers and a plasmacannon. All missed and the plasma cannon killed him self! 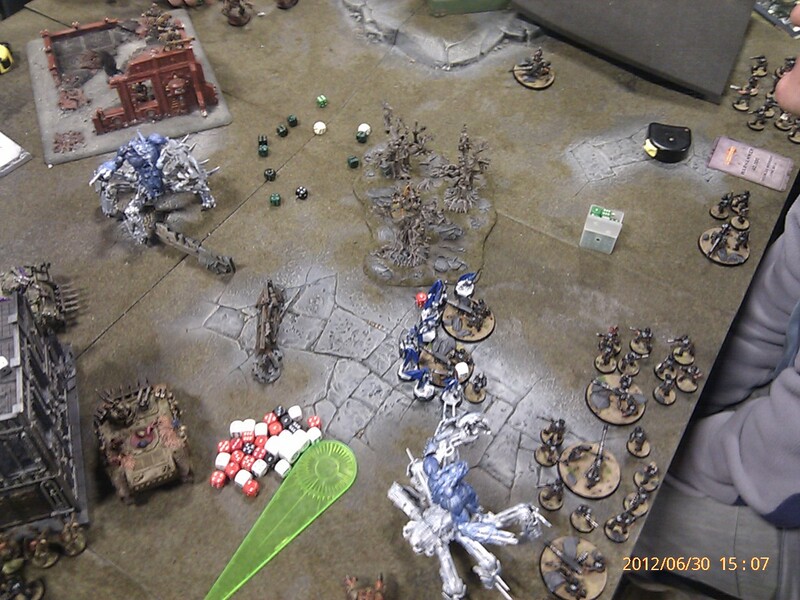 A lone wolf in combat for about 6 turns with a guard command hq, drawing combat every round cus he could only manage to kill one and they had a standard making them get +1 combat res! Even more cool stuff happened in this game but i feel the above is enough to highlight how awesome it was. Great guys to, thanks if ye ever read this. 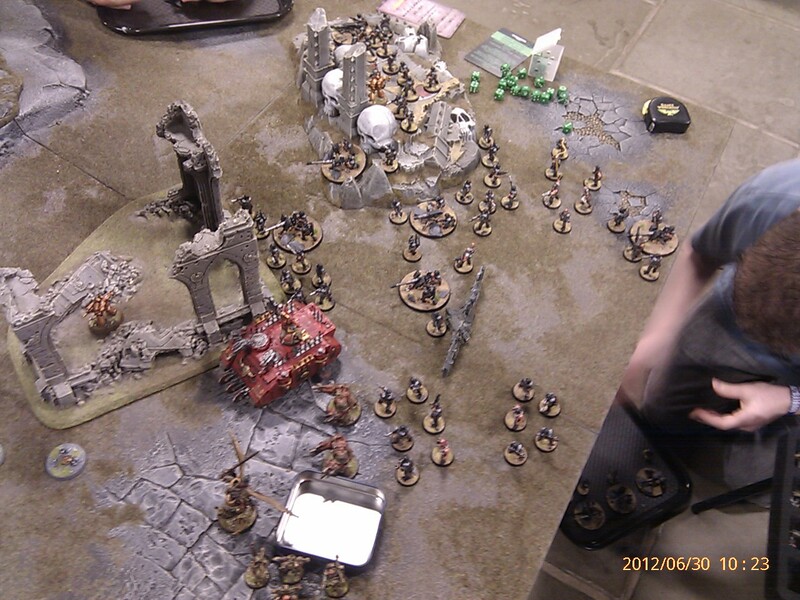 Borak turned up the next day to take control of his army and we set to play against a necron and imperial guard team. The mission was to capture table quaters and by the end of the game (which went to turn 7!) there was no clear winner. 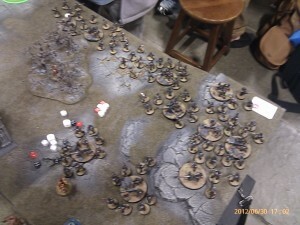 Their force was pretty dirty and included 2 griffons and 3 maxed out guard pshchic battle squads! needless to say this put some fear into Borak as thats a lotta pie plates. 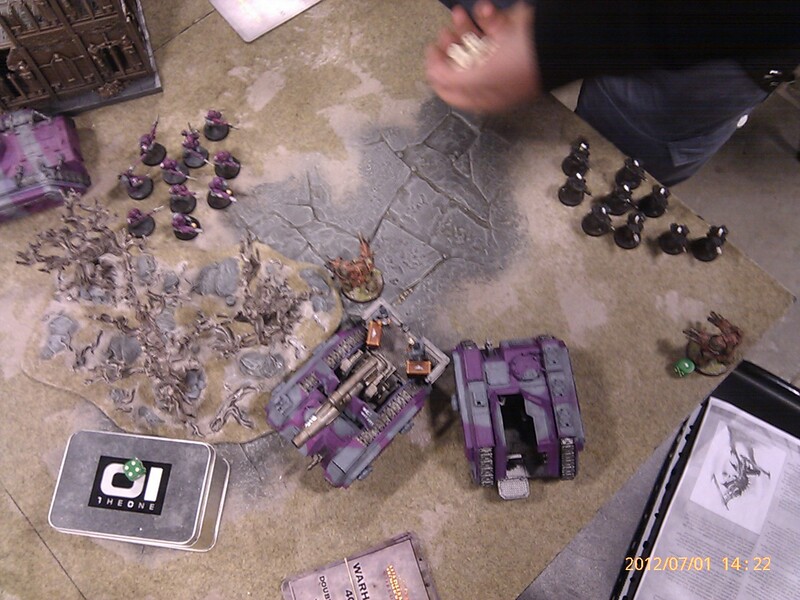 Luckily my berzerkers were on form this game and killed all 30 of the psychic battle squad dudes! 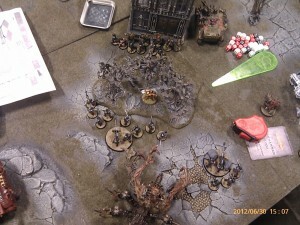 (Khorne hates magiC! ), they did fumble a bit at the end charging 10 guard vets to no damage to the squad and in turn the guardsmen killed the 3 of them that were left by that point! 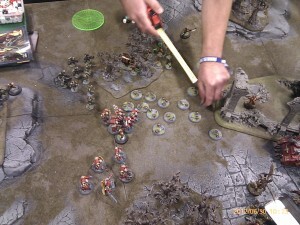 These guys had a sneaky trick by using trying to use the psychic battle squads to lower the ld of a unit and then use a necron flamer weapon that uses the ld of the model instead of toughness to wound! They managed to get my daemon prince to ld3, tried this with glee on their faces saying ‘t3, 2 to wound instant death’ Unlucky for them that they forgot daemon princes not only have eternal warrior but also an invulnerable save, that i made! heh poor guys they had been trying to pull that move off all weekend they said. Our last turn Borak managed to shoot down one of their pesky flyers in the very last turn, securing us the win. 3 contested table quaters to one controled by us. I forgot to take pictures of this game (grr). 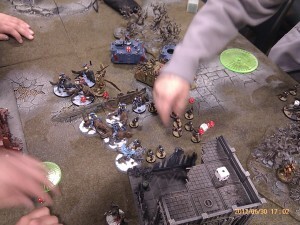 Game 5 was awesome as it was against some local guys. They are younger than us (heck me an Borak used to work at GW when one of them was like 12 as a beginner). We dont play in store very often so it wasn’t like this was an everyday game against a regular opponent. Needless to say we could not loose this game, my self and borak are nearly in our 30s and to loose against these guys would result in literally never hearing the end of it. 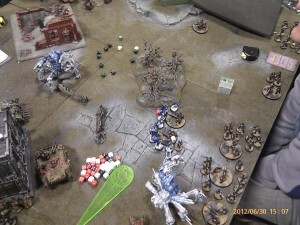 They had gone for mech guard, you know the one melta vets a plenty and a crap load of medusas with siege shells. 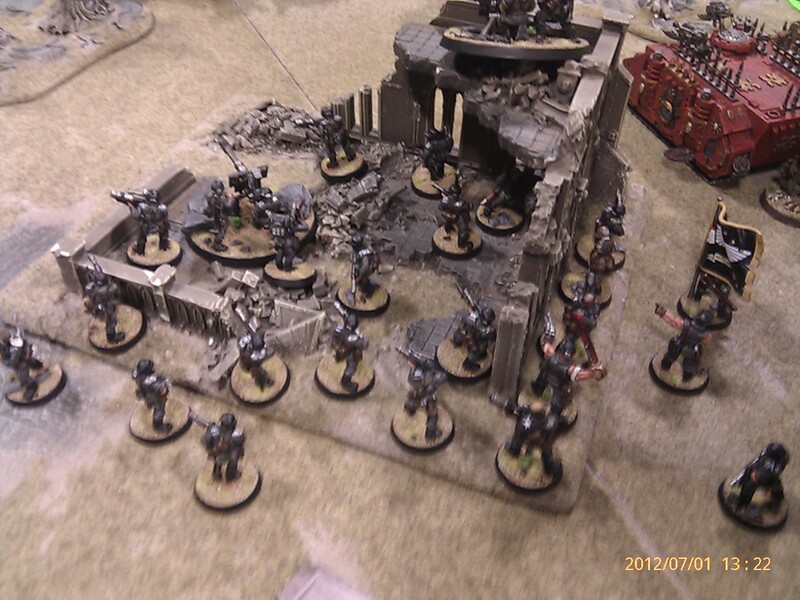 The mission was pitched battle kill points so the pressure was on. 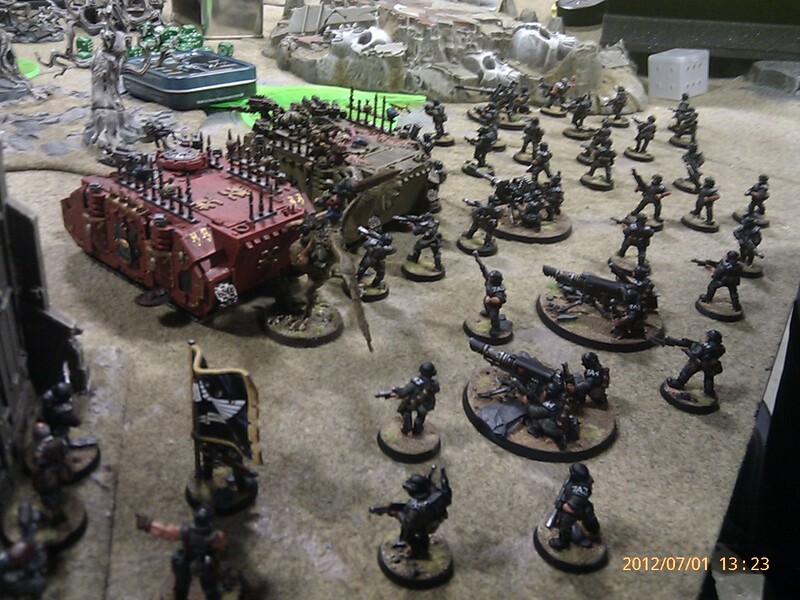 It was a really great weekend, so much 40k it almost gave me a nose bleed. Met some great people and had a really epic time. Defo gonna go to another one in the future.